TechEBlog had one of the funniest things I have seen in a long time. Check out the Machine Gun With Everything! It is still missing a few things though, where is the cup holder, USB charger for the iPod, GPS unit… If anyone has more info about this unit I want to hear from you. And more importantly… Where is the kitchen sink ?!?! Ahh! I just love Photoshop! Yes, but can it play Doom? It’s not a gun it’s airsoft. If it were a gun it’s missing the bayonet. Pansy. The link at end shows the bayonet the government will give you with your M4 if you like playing in sand. 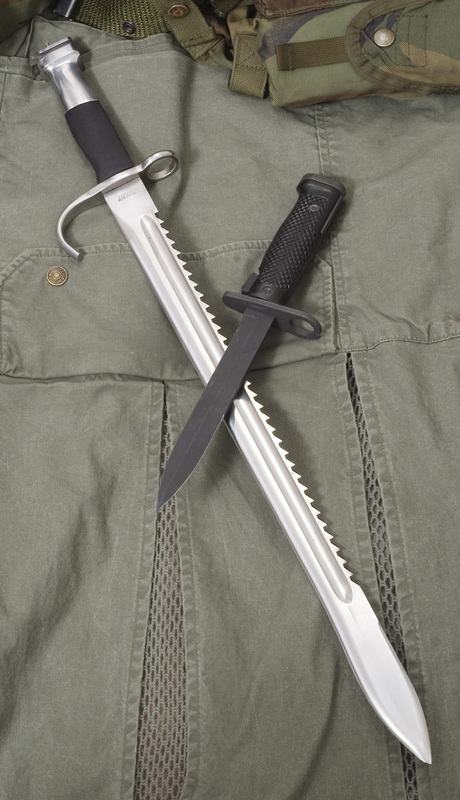 The M7 Bayonet is good for opening soup cans and letters from home. I have kitchen knives that are bigger. Hell I can get sushi knives that are more dangerous. The longer bayonet is what you get when a soldier who is also a blacksmith decides they want something cool. It’s a 1914 Swiss engineers bayonet and the sawback blade works. It is expertly modified to fit the M4, M16 or the unpansified AR15. It will hack through brush, small trees, barbed wire stakes and enemy solders. Oh, he writes science fiction too. It isn’t a machine gun, it is a semi-automatic AR-15. this picture is older than the internet itself, srsly. but really i saw this like 3 years ago on a few different websites. But i like the figurehead on the scope. yes, photoshoped it is… hahahaha dont you just love that software?? I think it needs more attachments plus it is a real rifle mrmeval. Aww, sweet! It has a Magpul! A Never Miss Gun….Nuam rem rem !!! Holy s____t! Who the devil made this?